Missing links brewed in primordial puddles? The crucibles that bore out early building blocks of life may have been, in many cases, modest puddles. Now, researchers working with that hypothesis have achieved a significant advancement toward understanding an evolutionary mystery — how components of RNA and DNA formed from chemicals present on early Earth before life existed. In surprisingly simple laboratory reactions in water, under everyday conditions, they have produced what could be good candidates for missing links on the pathway to the code of life. And when those components joined up, the result even looked like RNA. As the researchers’ work progresses, it could reveal that much of the original chemistry that led to life arose not in fiery cataclysms and in scarce quantities, but abundantly and gradually on quiet, rain-swept dirt flats or lakeshore rocks lapped by waves. In turn, their work could increase our understanding of the probability of life’s existence elsewhere in the universe. The research from the NSF/NASA Center for Chemical Evolution, headquartered at the Georgia Institute of Technology, is generously funded through a grant from the National Science Foundation and NASA. The recent results were published on April 25, 2016 in Nature Communications. Pursuing the origins specifically of RNA, the close chemical relative of DNA, a research team led by Nicholas Hud, a professor in the School of Chemistry and Biochemistry at the Georgia Institute of Technology and director of the CCE, worked with a pair of potential chemical ancestors of the nucleobases of RNA. For roughly half a century, scientists have hypothesized that life, which uses DNA to store genetic information, was preceded by life forms that used RNA very broadly. And RNA may have had a precursor, proto-RNA, with different but similar nucleotides (the “N” in RNA). Using two molecules known as barbituric acid and melamine, the researchers formed proto-nucleotides so strongly resembling two of RNA’s nucleotides that it is tempting to speculate that they are indeed their ancestors. The two ingredients would have been readily abundant for reactions on a prebiotic Earth, Hud said. “And they would have been well suited for primitive information coding,” he added. Because of the resemblances and properties, some scientists already have speculated on an ancestral role for melamine and barbituric acid. But the CCE scientists are careful not to jump to that conclusion just yet. Figuring out how adenine and uracil (nucleobases found in RNA today) combined with the sugar ribose (corresponding to the “R” in RNA) could answer one of the great questions of chemical evolution. The formation of nucleotides from possible proto-nucleobases and ribose marks a significant advancement in research on the origin of life. 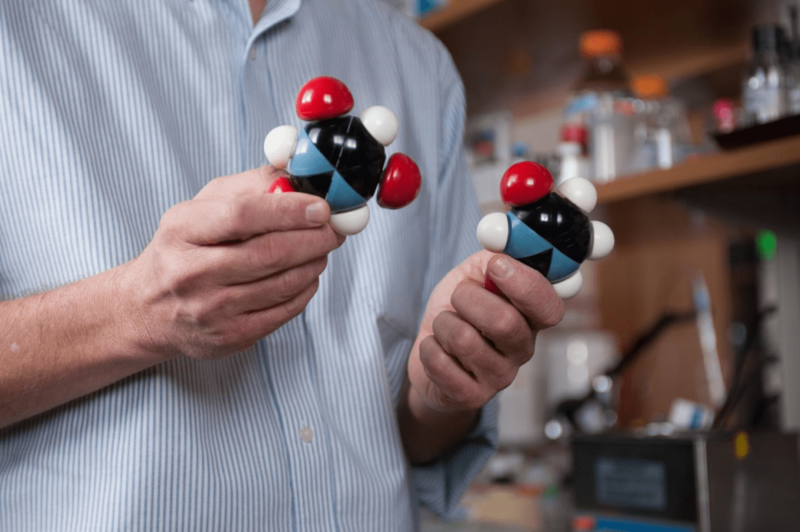 Nucleobases have been combined with other sugars in past studies, but the efficiency of the reactions discovered in this study is much greater than those of that past. “We’re getting close to molecules that look the way life may have looked in early stages,” Krishnamurthy said. A series of surprises added to the reactions’ scientific significance. First, they occurred quickly and the resulting nucleotides spontaneously paired with each other in water, forming hydrogen bonds like the Watson-Crick base pairs that create the “ladder-rung” pattern inside RNA and DNA helixes. Then the monomers formed long, supramolecular assemblages that look like strands of RNA when viewed with a high resolution microscope. There has been no reported chemical reaction so far that has produced existing components of RNA under commonplace circumstances that spontaneously form Crick-Watson pairs in water. And up until now, there had also been no report of a similar pair of nucleotides, like those produced with barbituric acid and melamine, behaving in a like manner, making this another first. There was one small caveat. “The reaction does not work as well if barbituric acid and melamine are present in the same solution before reacting with ribose because their strong attraction for each other can cause them to precipitate,” Hud said. So, the scientists completed the reaction involving barbituric acid separately from the one involving melamine. But that should not have proven prohibitive on prebiotic Earth. Barbituric acid and melamine nucleotides could have been formed in separate locations, even in the same pond. And they could have very well been plentiful. “These reactions are exceptionally productive, especially if you compare them to analogous reactions with existing RNA components, which do not produce any nucleotides under the same conditions,” Hud said. If melamine and barbituric acid formed their respective nucleotides (C-BMP for barbituric acid and MMP for melamine) in separate puddles on the early Earth, then rain could have easily washed the components together, where they would have rapidly assembled into what could have been a precursor to proto-RNA. “The question is: Can these self-assemblies make the transition into what makes up life today,” Krishnamurthy said. The researchers hope their work will help expand the scientific community’s approach to chemical evolution. “If you want to look at what brought about these properties of life you have to go back and consider all the other molecules that would have been present and see how they would have facilitated the molecules that are present in life today,” Krishnamurthy said. Their work also could serve as a basis for important practical applications, such as the creation of DNA or RNA-like polymers that could spawn production of advanced materials and therapeutic agents. The chemical reactions that produce the barbituric acid and melamine nucleotides don’t require the use of enzymes and extreme parameters like high heat and pressure. Reminiscent of click chemistry, they could contribute to safe, cost-effective and abundant industrial production.